The staff at the Point Pleasant River Museum appreciate all of the volunteers from near and far who jumped in and helped carry items within the building. First responders and civilians alike joined together to assist the Point Pleasant River Museum in their time of need. POINT PLEASANT — The Point Pleasant River Museum is currently open at a new location following last weekend’s fire. Ruth Fout of the River Museum said the new office is at 21 Main street. The River Museum’s phone number is the same, (304) 674-0144, but in the case that number does not ring through, call (304) 674-9898. The hours for the River Museum are Tuesday-Friday, 10 a.m.-3 p.m.; Saturday, 11 a.m.-4 p.m.; Sunday, 1 p.m.-5 p.m.
All items from the first floor of the river museum have been removed from the building; however, Fout explained the second floor still has items. She said they must wait for clearance before they are able to remove those items. Ruth Fout commented how much she, her sister Martha Fout, and Jack Fowler, Point Pleasant River Museum director, appreciate the volunteers who stepped up and helped them in their time of need. She said she saw not only local volunteers, but also volunteers from the Meigs and Gallia areas. A few volunteers even traveled from as far as Charleston. 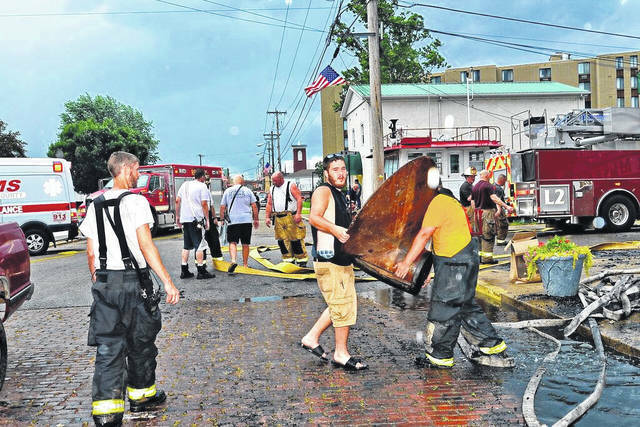 “We appreciate how the community jumped in and helped carry out items…and all of the first responders,” said Ruth Fout. Future plans of the River Museum and the cause of the fire are still in question. Ruth said they are deliberating about plans in their current location. She explained one goal they are working towards is selling tickets for the upcoming Belle of Cincinnati dinner cruise. For those wishing to purchase tickets should contact Ruth or Martha at the river museum. Ruth commented the tickets are limited. Following the cruise, the Tribute to the River during Labor Day weekend also brings in funds for the River Museum. 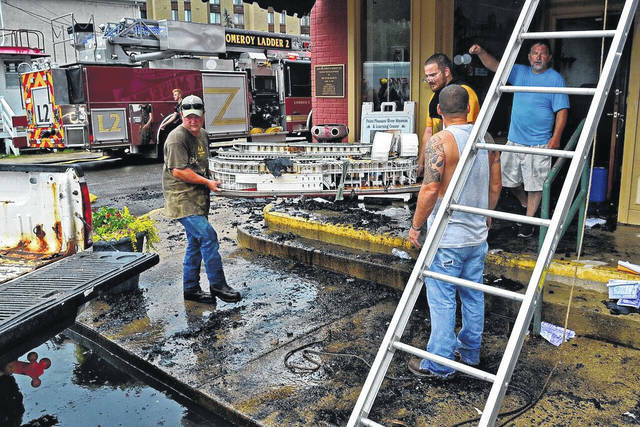 Donations for the River Museum can be made to the River Museum Rebuild Fund at Ohio Valley Bank in Point Pleasant or on Facebook at https://www.gofundme.com/river-museum-fire-recovery-fund. The amount raised in donations so far is $3,405. Ruth said donations can also be made directly to the River Museum, via telephone if it is a card payment, or through mail at P.O. BOX 412, Point Pleasant, W.Va., 25550.
https://www.mydailytribune.com/wp-content/uploads/sites/42/2018/07/web1_0707.River1_.jpgThe staff at the Point Pleasant River Museum appreciate all of the volunteers from near and far who jumped in and helped carry items within the building. https://www.mydailytribune.com/wp-content/uploads/sites/42/2018/07/web1_0707.River2_.jpgFirst responders and civilians alike joined together to assist the Point Pleasant River Museum in their time of need.